Tony Brooks won the German Grand Prix, a rather bizarre affair which was split into two 30-lap heats run on the same afternoon at the unfamiliar surroundings at Avus. Politics within the German federation meant the race was switched from the Nurburgring to the pre-war Avus circuit near Berlin, a simple track formed by running down two sides of an autobahn with a hairpin at one end and a steeply banked loop at the other. It was simple an incredibly fast. It was also perfectly suited to the Ferraris which had all missed the British Grand Prix a fortnight earlier but which returned with vengeance to take the first three places. Brooks' win was not too surprising, but the presence of two Americans in second and third - Dan Gurney and Phil Hill - was more so. In heat one, Brooks and Gurney battled for the lead with Gregory, now in a Cooper, until his engine blew. Hill finished in third. The second heat, with only nine starters after a spate of retirements, followed a similar pattern, with a lone Cooper, this time belonging to Bruce McLaren, mixing it with the Ferraris until his gearbox broke. Brooks once more took the chequered flag while Gurney and Hill swapped positions. The last few laps were tedious as the Ferraris, able to slow down to around 15mph off top speed because of their lead, "progressed in close formation, changing order almost every lap, without a challenger in sight". Other championship front runners had a bad day. Stirling Moss lasted a lap before his gearbox also gave up, while Jack Brabham's transmission gave up the ghost midway through the first heat. But the weekend was marred by the death of Jean Behra in a supporting sportscar race. Behra had been an ever-present since 1952 but walked out on Ferrari after a furious row at the French Grand Prix and so was driving a privately-entered Porsche. He lost control on a banked section, spun and piled into a concrete post. He was hurled from the car with such force his body knocked down a flagpole. 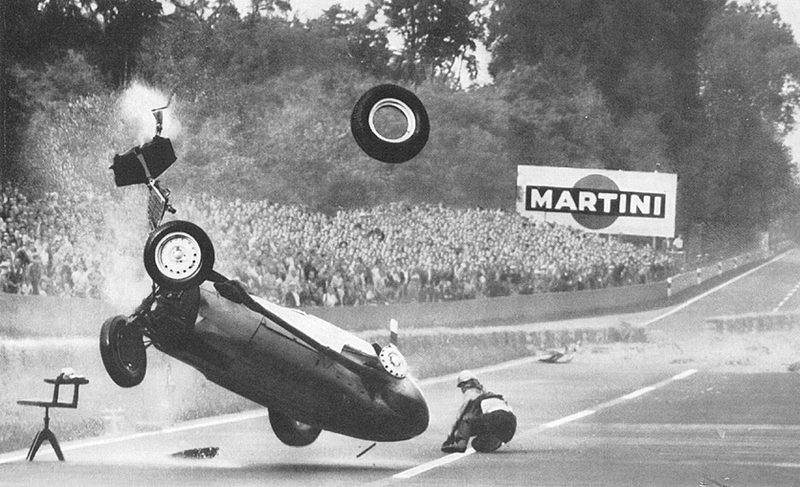 Luckier was Hans Herrmann who had a huge accident in a BRM which, captured on film, providing one of motor racing's most spectacular photographs.